Planning a trip to Spiti valley this season? Thinking about going by public transport? If the answer is yes then below is the latest schedule of Spiti Bus Service in 2019. 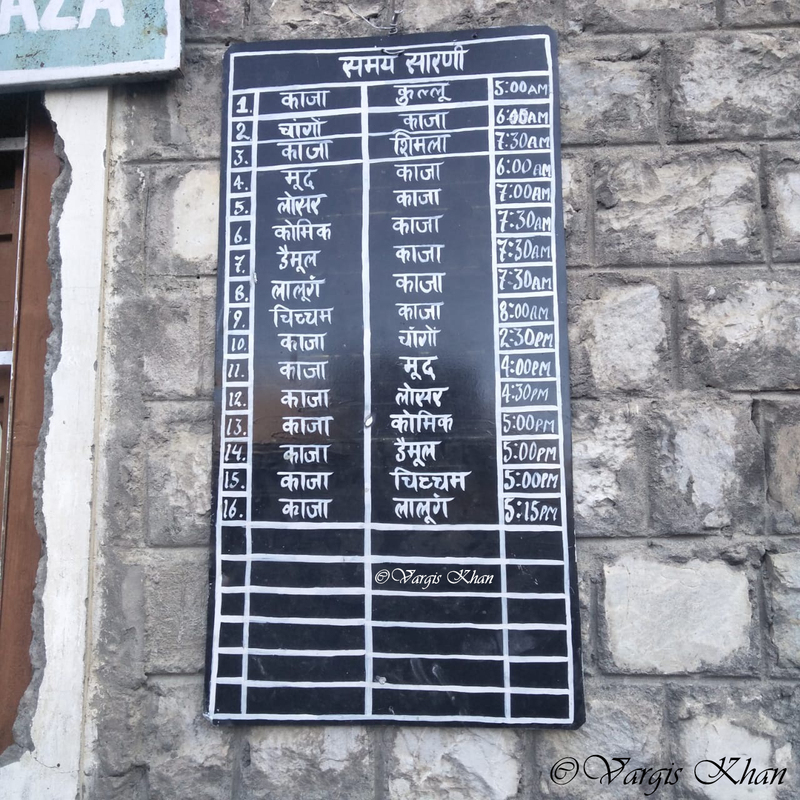 The image below is of the schedule from Kaza Bus stand. It lists the available buses and their timings that you can board to reach Kaza; as well as other buses to other parts of Spiti from Kaza. The language is Hindi, which if you don’t know then scroll down below where I have listed the same schedule in English. Also Read: How to Plan a Trip to Spiti Valley? Traveling to Spiti valley by Public transport is a great choice for people traveling on a limited budget. HRTC runs regular buses to and within Spiti valley that you can use to move between towns easily and comfortably. These are all ordinary buses but comfortable enough for a few hours of journey. Fare for these buses too is very reasonable since they get used mostly by locals and villagers. As a matter of fact, traveling by buses and shared taxis, you will easily be able to wrap up your Spiti trip in a budget of 10 to 12k at most. Another great reason why you may want to board a Bus for Spiti is of you weren’t too comfortable of your own driving skills. Spiti is notorious for its bad roads; and is definitely not the place where you would want to go if you weren’t sure that you will be able to handle a motorcycle or car well. If you were living in farther states like South or West India, then bringing your own vehicle won’t really be a choice for everyone always. In this situation too, Spiti Bus service would be the best way to plan your trip. Apart from the information below, I will also recommend you to take a look at HRTC Bus Time Table – AC and Ordinary Buses. This post lists HRTC bus timings to major town in Himachal Pradesh. Below is the bus schedule that is mentioned in the image above in Hindi. Schedule of other Buses that can be helpful for tourists. Kaza to Chandratal Bus – No Direct Bus available. You will have to board the Manali bus, get down at Batal and then hitchhike or walk to Chandratal. Kaza to Dhankar Bus – No direct Bus available. You can board either of the buses going towards Peo or Chango for this journey. You will have to however get down at Shishling and walk uphill to Dhankar. Manali to Chandratal Bus – No Direct Bus available. You will have to board the Kaza bus, get down at Batal and then hitchhike or walk to Chandratal. Buses to Sarahan – There are a few buses in the day that go to Sarahan. Your best bet would be to wait at Jeori chowk and board either a Bus or shared taxi for Sarahan. Frequency of shared taxis is more than the buses. Sangla to Reckong Peo Bus – Daily at 12 noon. Shimla to Chitkul Bus – No direct bus available. You will have to reach Sangla and look for a mode of commute there. Sangla to Chitkul Bus – There are regular private buses, shared taxi plying between Sangla and Chitkul and you will have no problem finding a mode of commute. There are only two places from where you can get a direct bus for Spiti Valley; Shimla and Manali. Of course there are a few variations to this statement; but as a tourist from outside of state of Himachal, best thing to do for you would be to reach either of these cities and then board a Bus for Spiti. Both Shimla and Manali are among the most visited hill stations of our country and are very well connected to almost every major city nearby. You will have absolutely no problem finding a bus that is headed to either Shimla or Manali. For bus timings to these places, please look at the HRTC Bus time that I provided a link to in the para above. There is a daily Bus service from Shimla to Kaza that leaves Shimla Bus stand at 6 AM. This bus completes the entire journey in 2 days with a night halt at Reckong Peo. It starts from Shimla in the morning and reaches Peo by late afternoon. From Peo, it then starts in the morning at 7 again and reaches Kaza by late afternoon. This is the Bus that you would really want to rely upon for your entire Spiti trip. It runs through the entire Kinnaur and Spiti valley before finally making it to Kaza. You can board it from Shimla and get down at the town of your choice. From that town then, you can board the same bus next day at the same time for your next destination. For example, if you wanted to visit Narkanda, then board this bus from Shimla at 6 and it will drop you at Narkanda at 10 AM. The next day, wait for this Bus to arrive and board again at 10 AM for your next destination. Let us say for example that you wanted to go to Sarahan next. So board the bus from Narkanda at 10 AM and it will drop you at Jeori at about 1 PM. From Jeori then, take a shared cab to Sarahan and spend the night. The next day, be back at Jeori at 1 PM to board this Bus again for your next destination which in all probability would be (and should be) Reckong Peo. Your total fare from Shimla to Spiti valley would come out to be approximately Rs. 500 per person. The bus from Manali to Kaza starts from main Manali Bus stand at 6 AM. It takes the route via Rohtang Pass, Gramphoo, Batal and Kunzum Pass before finally making it to Kaza by evening. There is no booking system available. It is an ordinary bus that you will have to board and buy a ticket on the spot. This is an extension of the Shimla Kaza Bus that I mentioned above. It starts from Reckong Peo at 7 AM and reaches Kaza by evening while traveling through Pooh, Khab, Nako, Tabo and Dhankar. There is no direct Delhi Spiti Bus available. If you want to travel from Delhi to Spiti Valley by Bus then you would have to break the journey in 3 days and use three different buses. You would first board a Bus from Delhi to Shimla, then Shimla to Reckong Peo and finally Reckong Peo to Kaza. Your Delhi to Spiti Bus Fare total would come out to be approximately Rs. 1,000 for all these three ordinary buses. There is also a direct bus from Delhi to Reckong Peo that you can board. Traveling this way, you won’t have to break the journey in Shimla and will directly reach Peo in about 18 to 20 hours. There is no direct bus from Chandigarh to Spiti Valley. You will either have to reach Shimla, Manali or Reckong Peo first from Chandigarh and then board a bus from Kaza. Regular HRTC buses ply from Chandigarh to all these three destinations. There is no direct bus from Bhuntar for Spiti valley. You will have to reach Manali first and board the Manali Kaza bus. Like Chandigarh, there is no direct bus from Dehradoon to Spiti. You will first have to reach Shimla, Reckong Peo or Manali. There is no direct bus available from Dharamshala to Spiti valley. You will have to reach Shimla, Reckong Peo or Manali first. There is no direct bus from Kasol to Spiti valley. You will first have to make it to Manali and then board Manali Kaza bus. For all these destinations, I would recommend you refer to the HRTC Bus Time Table article that lists down available bus services to Shimla, Reckong Peo and Manali. I hope the information above on Spiti Bus Service was of help. If you have any other questions; or need any further details; please feel free to ask in the comments section below; or at our Community Forum; and I will be glad to answer. Hi Mr. Khan.. I am deepak.. I am planing to Visit Kaza spiti valley in April.. Is it good time to visit ? and I am from punjab so my route will start from chandigarh to shimla to kaza.. Can I get bus from Shimla to Kaza and what will be route and fare.. ?.. Hello Mr. Jindal – Yes April is a good time to visit but it will be very cold so prepare accordingly. For information on bus, please see the post below. Hi Vargris, I’m planning to visit Spiti Valley after Ladakh trip in summer. Does it have any bus or jeep share from Keylong connect to Kaza? Hi Achi – Yes you can find shared jeeps between these places. I am planning for a solo trip to spiti by 3rd week of December. Is the above mentioned bus services available on December? Hi Renjith – Yes the bus service remains available throughout the year unless fresh snow blocks the road for a few days.